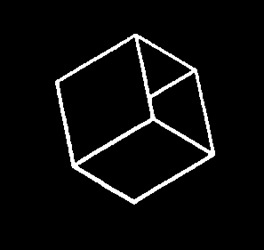 I introduced my 1969 television lecture on manuscript illumination with an algorithmic animation showing a cube rotating on its axis and spiraling to infinity and back. The sequence, joined to electronic music, served as a brief graphic introduction lasting about 30 seconds. Shortly after arriving in Minnesota to teach at MCAD I was invited to present one of a series of public television presentations featuring the work of the monks at St. John's Abbey. My 1969 lecture addressed the manuscript illuminations in the then recently established microfilm collection of medieval manuscripts located in the Hill Manuscript Library at St. John's University, Collegeville, Minnesota. This lecture was one of about 8 weekly Public Television presentations on the cultural contributions of the Benedictine monks in Collegeville Minnesota. 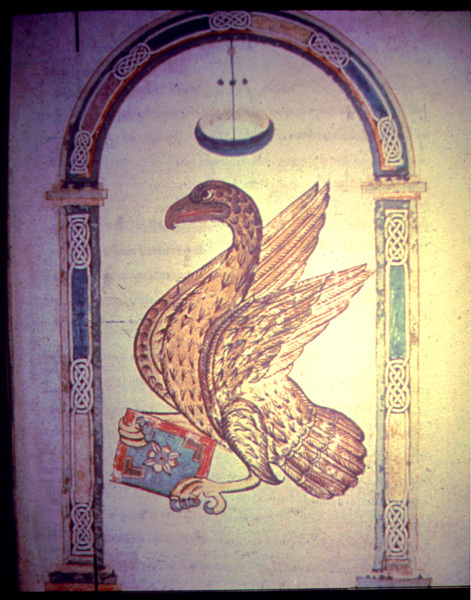 show John the Evangelist both as Scriptor and as symbolized by the Eagle. To introduce the medieval illuminations I included the brief algorithmic animation shown above. The electronic sequence provided a provocative lead into the subject matter. "If the monks were living today", I noted, "they would be exploring this new media for illuminating their most treasured texts". Since then I developed my own electronic scriptorium, a studio with several pen plotters, my "scribes", for executing my coded instructions. The ideas used to introduce that lecture in 1969 took shape, over a decade later, in the form of my Diamond Lake Apocalypse series (1990 ff) and the Pearl Park Scriptures (2005 ff). Note 1. 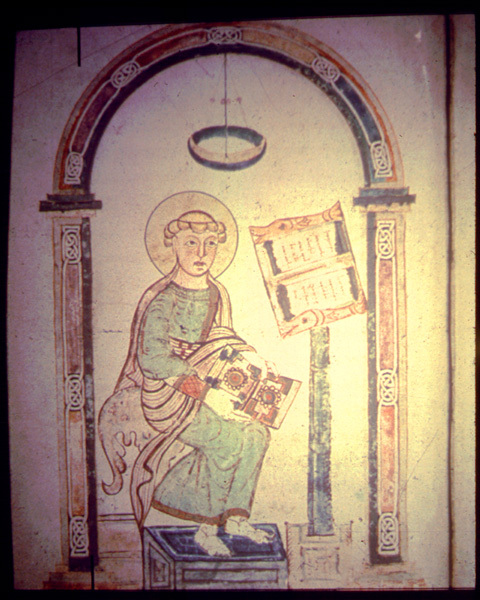 The Codex Millenarius contains all four Gospels in Latin translation and has been used in liturgy up to this day. Its priceless value is based on in its age, its elegant Carolingian script and its illuminations. This Codex includes eight full-page miniatures depicting the four Evangelists and their symbols, the four relevant sumptuous initials introducing the Gospel texts, and a few remainders of the canon tables. Note 2. The microfilm project in Austria and Germany was guided by Father Oliver Kapsner, OSB, a bibliographer committed to documenting the work of Benedictine monks. I had the good fortune of getting to know him during a period when he worked on a bibliography of work by Benedictines in the United States. At that time he was resident at the monastery at St. Vincent Archabbey, Latrobe, Pa. ( ca. 1954-59) while he labored on the bibliographies of the monks in America. I recall evening walks when we shared mutual interests on history. Later, as an encyclopedist, I recall how much I admired, used, and respected his work. When offered to present the lecture on his microfilm collection I was honored and deeply touched by the privilege.